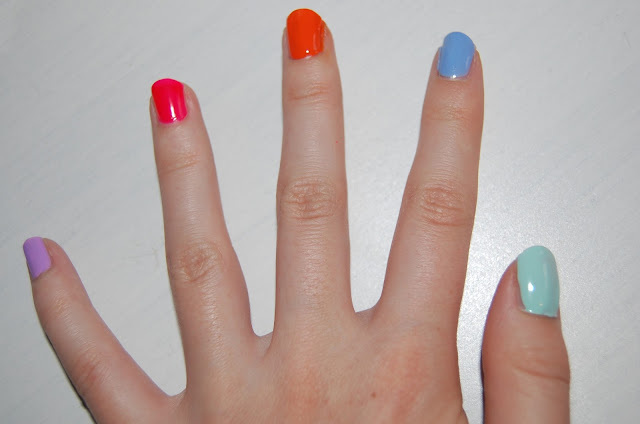 I don't know about you guys, but Spring/Summer just scream pastel and bright nails to me. Here are 5 of my favourite nail polishes that I'll be rocking when it (finally!) gets warmer. Angelica Palma Violet / Angelica Hip Hop - Angelica polishes can be picked up from Primark and cost around £2.50. Opaque in a couple of coats and dry quickly, these are just 2 of my ever-growing Angelica collection. Palma Violet is a lovely lilac colour and Hip Hop is a super bright pink corally colour - a favourite for my toenails! Essie Fear & Desire / Essie Bikini So Teeny - 2 higher end polishes and the newest additions to my collection. Bikini So Teeny was huge last year and I suspect it will be this year too. Fear & Desire is a wonderfully bright orange and Bikini So Teeny is a pale blue with the subtlest sparkle. MUA Pistachio Ice-cream - Apparently a dupe for Essie's Mint Candy Apple and at just £1 a bottle, MUA polishes are a fairly good cheap alternative. Pistachio Ice-cream is a pretty pastel green. Angelica Palma Violet, Angelica Hip Hop, Essie Fear & Desire, Essie Bikini So Teeny and MUA Pistachio Ice-cream.